Get your Free Guides Now! As the fastest growing form of marketing media, video content is an exciting prospect for businesses. In 2015, branded videos were reaching close to 50% of the UK’s total population – and that’s a figure that’s set to get even bigger. It’s small wonder that video marketing strategies have become a top priority for companies this year. However, as it’s a relatively new form of marketing, you may have a lot of questions about it. Last year, we released a helpful free guide, outlining how to get started with an effective video marketing strategy. This year, based on your feedback, we’ve updated the content; adding fresh information, tips and techniques – and we’re offering them as four free guides to download. How do you decide which video is best for your needs? Which video marketing services offer the best ROI? When / how / where should you use video content? How do you market it successfully? The customer purchase journey – when to use video content to generate the best results. The different forms of video for business – and the advantages of each. Aligning video content with your business objectives – to ensure you get value for money. Repurposing – How video can be repurposed to offer better ROI. Video marketing – Where to market your content to build brand awareness and appeal to your target audience. Absolutely! In our guides, you’ll find out how video can enhance the marketing strategy of any company – regardless of your industry, size or target audience. You’ll also see how video can be used at any stage of the sales journey – from developing brand awareness to securing a sale. Last year, 52% of marketers said that video generated the best return on investment. Our guides show you how to enjoy the same success. We know that the best kind of information is digestible. Generally speaking, smaller chunks of information are easier to grasp than pages and pages of text! 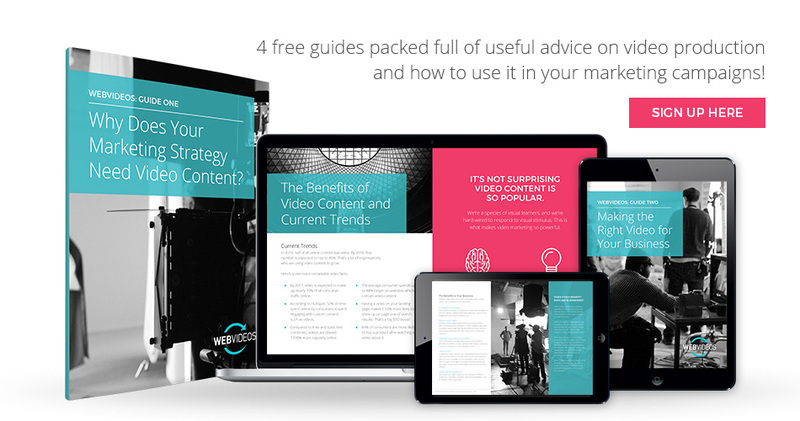 Here’s a few other reasons why we’re now offering four free guides, rather than one. Easy reference – Each guide covers a distinct area, so you’ll know where to look to find the information you need. The stages of the process – Video comprises a number of distinct stages: initial concepts, production, editing and video marketing. Our four guides cover the individual areas in depth. More useful information – By dividing the content, we were able to add plenty of fresh information – ensuring all content is up-to-date, relevant and useful. To receive your first guide, simply use the contact form to sign up and we will send it to you when it’s released. Don’t worry, we won’t bombard you with information, nor will we pass your details on to third parties. We’ll only ever get in contact when we have something of genuine value to share with you. The free guides are released on a staggered basis; giving you the time to read each one properly, and ask any questions, if required. We hope you’ll find them helpful – but remember, if you feel we’ve not covered any important topics, get in contact and let us know! To start finding out more about video content marketing and how it can help your business, simply click the button below and sign-up… .